I don't think I've met a single soul who doesn't love brownies. Fudgy, rich, chocolatey bites of deliciousness that bring about feelings of pure delight. But brownies are even better when they're good for your body too! You guys have been asking for more healthy and easy snack recipes, especially baked goods (which I'm glad about because those are my favourite too!). And I know not everyone has the spare time to do a lot of baking and prefer to keep things as quick and easy as possible. So I thought I'd share with you the most effortless, vegan and gluten free fudge brownie recipe, that you can whip up in your spare 10 minutes! I found this vegan brownie mix from Unique Muscle which is made from all natural and wholesome ingredients (no artificial sweeteners, preservatives or other unnecessary additives! ), and thought I would give them my own spin and see how it turns out. The original version according to the packet directions says to add banana, plant milk and coconut oil, which is perfectly fine and turned out amazing - except I wanted to try and make an even easier version!! Instead, I thought, why not use a tin of beans. Beans are packed full of fibre, plant protein, iron, calcium, B vitamins and a whole lot more nutrient goodness, while also lending a fudgy, moist texture to baked goods. Perfect for brownies. And, turns out it was a true success. Probably the most decadent brownies I've ever made. 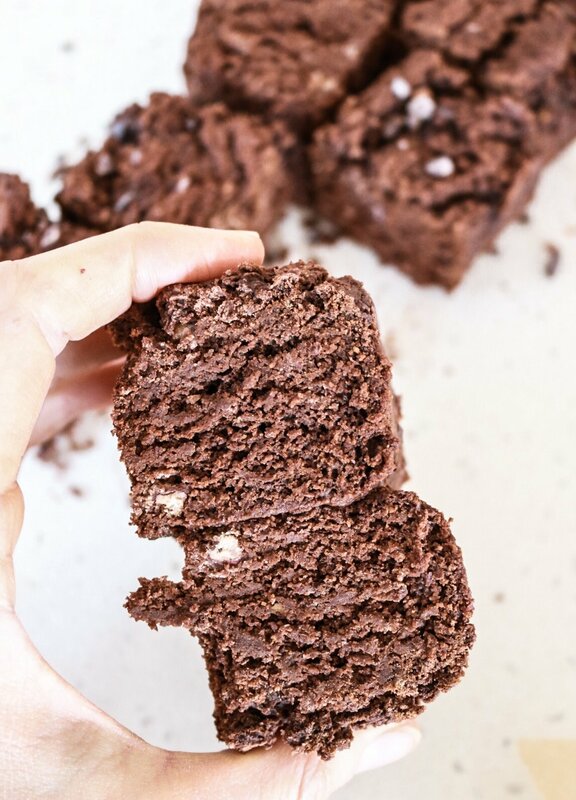 Crumbly on the outside, perfectly soft and fudgy on the inside. And they taste even better warmed up, like a gooey chocolate pudding. Pretty good for next to no effort and just two ingredients if you ask me! Preheat oven to 180 degrees Celsius and line a brownie tin with baking paper. Puree your beans, then gently fold through the brownie mix, adding about 1/2 cup of water or almond milk to get it to a brownie batter consistency. Spoon into the prepared tin and bake for 35-40 minutes until firm and crusty on top. Allow to cool before slicing. Enjoy! These brownies taste even better warmed up with a dollop of coconut yoghurt! This post is a collaboration with Unique Muscle, however all views and opinions are my own. I only ever promote products that I truly love!